I did it! 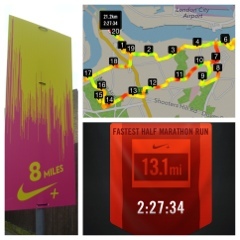 I finished all 13.1 miles (21km) of Run To The Beat! 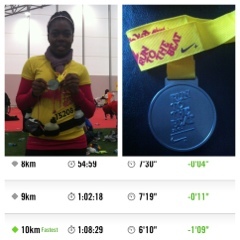 I’m still waiting for my official race time, but I came in somewhere around the 2:30 mark! Carb loading was fun! Saturday I made myself pecan pancakes which I had with some streaky bacon and maple syrup! It’s no pasta, but heck I needed a treat! I was dressed appropriately for the chilly weather and bitter wind! I will be rethinking my bin liner policy as it would have kept me protected from the wind when waiting to start in the pens. Thank you to the guy who cheered me on to keep going at around mile 6…that really did help! The pacers were really useful! I spent the entire final 7 miles passing, then being passed by the 2 hour 30 min pacers! I picked up a hydration belt a few days ago which meant I always had fluids readily available as opposed to where the stations were. Fuelled by water, Lucozade and Clif Shot Bloks…I kept steady to the end. My finishers medal was ready and waiting for me at the finish line! One more to add to the collection! I spent about 40 minutes queuing to get my bag at the end of the race; at this point, I was starving (food in bag), sweaty (fresh clothes in bag) and needed to get off my feet and get home rather than stand after running my first half marathon! The name suggests that you would be bopping to tunes the whole way round; the reality is that you spend about 30 seconds (if that) running past each music station so barely having time to listen to any of the tunes they were banging out! There were not that many toilets on route, so that meant long queues. Anyone that stopped would have added at least 5 minutes or more onto their time. I luckily managed to run the whole race without needing to stop for the bathroom. The hills! THE HILLS! …the worst was somewhere close to the end; my legs were threatening to give up on me so I was not excited by a stint downhill. Earlier I sprinted down the hills to make up time for slowing down going up but this time, this time I needed to take it easy to not lose control. You can’t practice that on a treadmill! 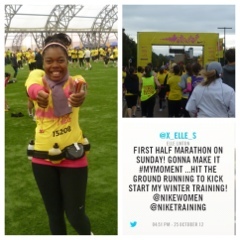 Make it #MyMoment I did…and as someone much fitter than me once said…onto the next one! Hoooray!!!! Congrats on finishing the race on such a cold dreary day. Totally agree with all your good, bad and ugly moments – but at the end of the day, it's time to be damn proud for completing a HALF MARATHON! Yay!